Arrow Dynamics shafts are built specifically for the traditional archer. Our exclusive parallel to taper offers a excellent spine to weight ratio. The Traditional Series may be used with a wide range of stickbows and longbows. 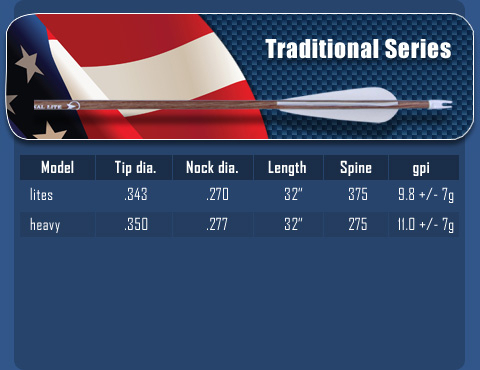 The Traditional is rated for 68-95lb bows while the Traditional Lite works great for 35-65lb bows. The non-glare, wood grain finish is durable and will not wear out or fuse into targets. Made in USA! TRADITIONAL SERIES BLACK This shaft is a black (no woodgrain) shaft made with the same quality material and finish as the woodgrain shafts but a lower cost.